Lunasol Nature Colour Eyes EX01 Nature Summer Blue was the highlight of the current summer collection for me. I picked it up at the dutyfree shop in Narita Airport Terminal 1 South Wing for 4250 yen (about S$64.50). The usual retail price in Japan is 5250yen (including 5% sales tax). In Singapore, Lunasol quads retail for S$77. 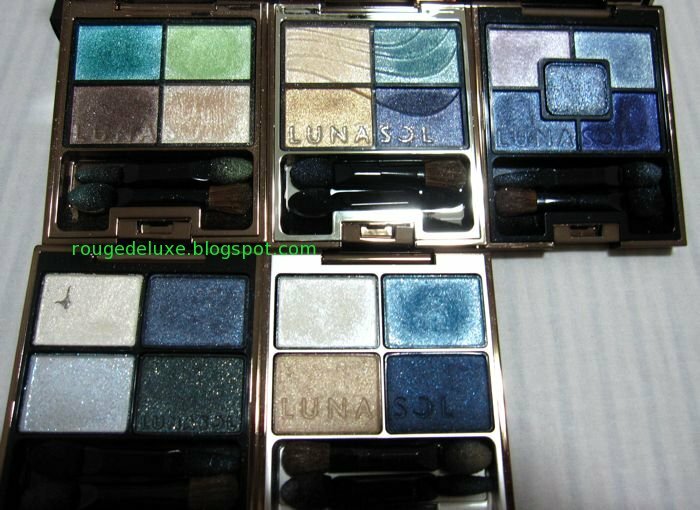 The eyeshadows are the standard Lunasol quality, finely milled with good colour payoff and a smooth non-gritty shimmer. For this look, I used the brush applicator to highlight the browbone area with the light beige shade and the fat sponge applicator to apply the light blue shade from the inner corner to the middle of the lid and along the lower lashline. Then I used the fat sponge applicator to apply the medium blue shade from the middle of the lid to the outer corner and along the upper lashline. Next, I used the brush to blend the gold shade into the outer half of the crease and finished with Heroine Make Smooth Liquid Liner and Lancome Virtuose Precious Cells mascara. 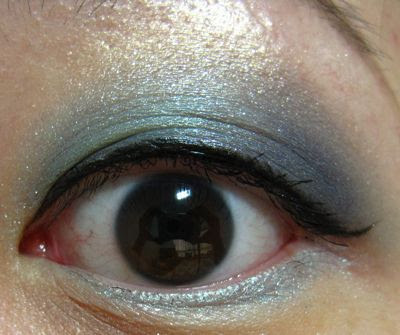 The eyeshadows lasted quite well over more than 10 hours of wear. There was a bit of creasing at the inner corners. 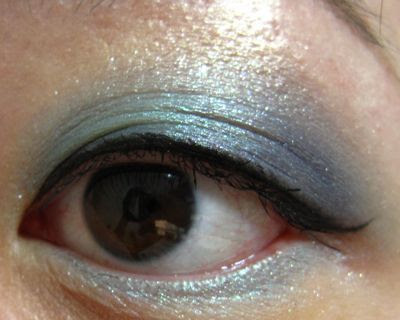 The medium blue shade also oxidised somewhat so the blue tint was much less visible at the end of the day. The most similar quad to Nature Summer Blue is Skin Modelling Eyes EX02 Beige Cool, which was a limited edition quad from the Summer 2007 collection. However, Nature Summer Blue is more vibrant compared to Beige Cool. Here's a comparison pic of Nature Summer Blue with Lunasol's other blue-themed quads. Top row (left to right): Sheer Contrast Eyes EX01 Blue Green Coral, Nature Colour Eyes EX01 Nature Summer Blue and Geminate Eyes 04 Sapphire. Bottom row (left to right): Star Shower Eyes 03 Dazzling Night and Skin Modelling Eyes EX02 Beige Cool. If you already own Beige Cool and Sappire, then you probably can do without Nature Summer Blue. But Nature Summer Blue is still a pretty quad well worth having on its own. The Summer 2010 collection was released on 14 May in Japan. Singapore usually gets the new collections about 2 months after Japan. do you know if the hbg mooks 'stupid army' and 'pop'n party' have different contents or not? My favourite brands to purchase in Singapore would be Paul & Joe and Lunasol, but it really depends on what type of makeup you like as the offerings by each brand can vary greatly. For the drugstores, there's Majolica Majorca, Canmake, Rimmel and Bourjois all offering pretty good products at affordable prices. For the department stores, I purchase stuff occasionally from MAC, Bobbi Brown, RMK and Stila. The brand that I buy most consistently is Paul & Joe. Yes, the stupid army and pop'n'party mooks are the same in terms of the contents, according to the tkj.jp website. 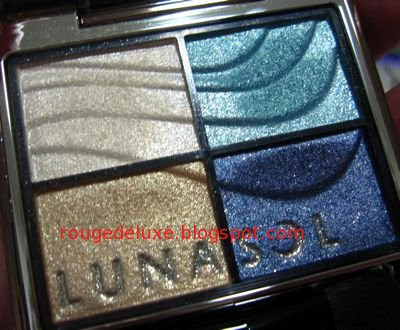 Lunasol Nature Summer Blue is a really beautiful quad indeed! I like how you applied the shades! Just not in the mood for FOTDs lately. Nature Summer Blue is a limited edition palette so it is only available while stocks last. I don't know how quickly Taiwan sells out of Lunasol LE quads. I don't know if the Taka counter is taking pre-orders yet so it's best to check directly with them, including when exactly the collection will arrive. The two month delay vis-a-vis Japan is what the Kanebo SA has told me in the past but this is just a general estimate. Very pretty blue palette you hv got..